Brown Turbo Consulting specializes in custom turbomachinery design and analysis. Complete aeromechanical design services are available. structural analysis is carried out concurrently with the aerodynamic design. with ADPAC (See CFD Validation). Fluent is generally used for pumps. 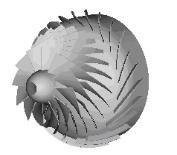 relying heavily on turbomachinery software developed at NASA-GRC.